After creating AccountSight's easy to use Project Resource Planning and Scheduling module, we noticed a high degree of adoption by many companies with over 50 users in the past year. Over the course of time we have added a number of useful reports and upload capabilities to planning; however, we have received an overwhelming interest in a Visual Gantt or Calendar view. 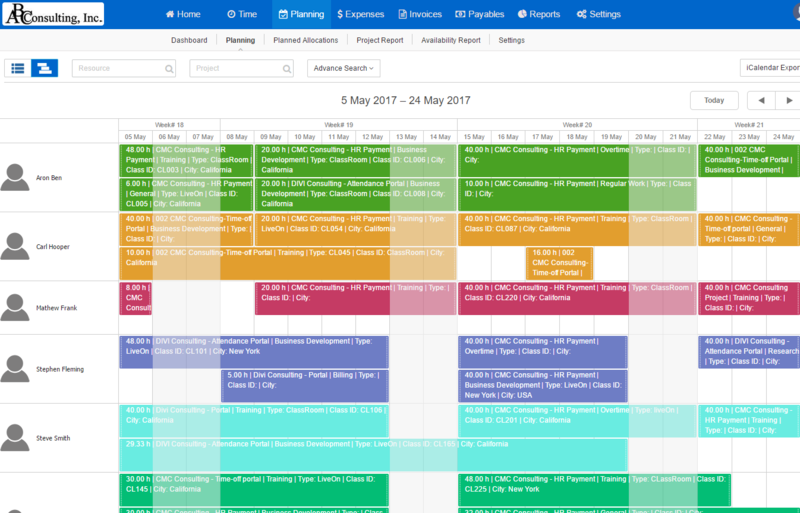 The AccountSight development team has worked for the past few months to deliver an elegant and practical resource planning user interface to allocate, query and search resource time directly in the calendar view. Quick search of allocations by resource and Project names. Best part is that you can simply create allocation event by dragging the mouse over the calendar and assigning appropriate project assignment. AccountSight has added provision to create up to 10 user-defined fields or user-defined attributes for any project allocation with out of the box report for those. Any of these fields can be displayed on the project allocation event. For more information or a quick walkthrough, please call or email support.